Genaro Network is otherwise known as "GNX" and runs separately from a central bank or single administration. You cannot mine the decentralized cryptocurrency, so in order to obtain GNX, you can buy with a cryptocoin exchange service. Genaro Network can be found online, on social networks like Reddit. 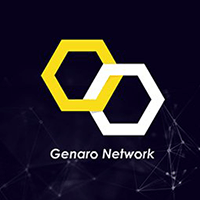 We don't have any wallets listed for Genaro Network yet, check back soon! We don't have any debit cards listed for Genaro Network (GNX) yet, check back soon! We don't have any price charts listed for Genaro Network yet, check back soon!